Last week a handful of our giants headed over to the Kent Event Centre to take part in Kent 2020. Our very own Anthony Klokkou gave a presentation about delivering growth through search marketing which was really well attended. 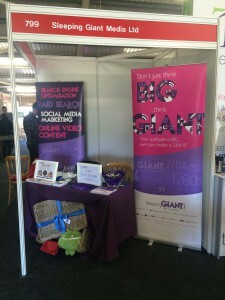 On our stand we held a giveaway to win a hamper by asking people to give us their business cards. The lucky winners were Cavendish Communications, who are now the proud owners of a gorgeous hamper from one of our clients, Spicers of Hythe. @SleepingGiantM @SpicersofHythe Great news! Thank you! We will look forward to receiving it. Our hamper wasn’t the only freebie to be had; our pens were very popular, and we made sure we left with plenty of swag ourselves. We met Hazel the eagle and Flint the owl from the NBC Bird & Pest Solutions and they were definitely a highlight of our day. We had such a great day meeting people from a wonderful range of different businesses. We can’t wait for the next event!